It's almost Donut Day and that means you can stop by your local Dunkin Donut and Krispy Kreme stores for FREE Donuts on June 6th! Participating Dunkin’ Donuts stores will offer guests one free donut of their choice with the purchase of any beverage. Read more on about the Dunkin Donuts freebie here. Also on June 6th, stop into Krispy Kreme for a free donut. No purchase necessary here! Read more about Krispy Kreme's celebration here. Participation may vary, so please check with your local store to see if they are offering these deals! This offer may not be combined with other offers. Check store for details. 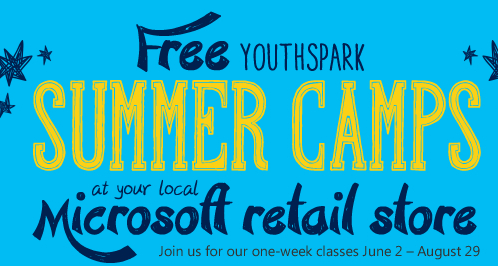 Registration is now open for free weekly in-store camps. These camps are broken up into two age groups. One group for Jr. Designers (recommended for ages 8-10) and another group for Designers (recommended for ages 11-13). Learn more about Microsoft Camps here and sign up today. 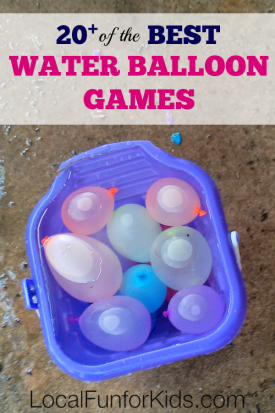 The past couple of years, I have written about Water Balloon Games for Kids, and this year I'm putting together my best list yet! Whether you need a water balloon game for summer camp, field day or just a lazy summer day, I hope you'll find something here that you like! 1) The water balloon version of 'Hot Potato' is a great twist on the original. Get the kids to sit in a circle and start passing around a water balloon. Start playing some music and then, at random intervals, turn off the music. Whoever is left holding the water balloon or whoever pops it is the one out. The last child left in the game is the winner. 2) Paint with Water Balloons - My kids and I have used balloons for painting and the results were absolutely beautiful. Our balloons were filled with air, but adding weight and movement with water balloons is a completly new sensory experience for kids, and you'll be surprised at how beautiful the results can be. 3) Water Balloon Number Target Practice - Combine number recognition review and water balloons for a fun, easy and educational summer game. Read more at Mom to 2 Posh Lil Divas. 4) Balloon Roll - For this game, you have to keep your water balloon on the ground. The child that rolls their water balloon the farthest, and does not pop it, wins! 5) Nothing is better on a hot summer day than Water Balloon Dodge Ball. Last week, my boys decided that I was the going to play this game with them, even if I was fully dressed. There are too many serious moments in life, so letting your kids hit you with water balloons can be really fun. If you have a group of older kids, you can really get an organized game of dodge ball going. First, make sure you have a lot of water balloons and a bunch of kids. Separate the kids into teams and then, let the kids go at it! If you get hit by an opposing team member, you're out. 6) For older kids and teens, Water Balloon Darts can be a fun activity. Just prop up the balloons on a target, give each one a value (20 points, 40, points, 60, points, 80 points and 100 points.) See who can accumulate the most points for each balloon they hit. 7) Angry Bird Inspired Water Balloon Game - "Inspired by the mega popular video game Angry Birds this takes the game outside into the sun for fun all summer long." Read more at No Time for Flash Cards. 8) Water Balloon Relay Race - Set out one chair for each team and place a water balloon in the seat. Then, players take turns running to the chair, and sitting on the balloon till it pops. After they pop the balloon, they run and tag the next player. (You will need to put a new balloon in after each one is popped.) The first team to pop all their balloons and cross the finish line wins. 9) Water Balloon Sight Word Toss - It's really simple to help reinforce sight words while playing a water balloon toss game. Learn more at Royal Balloo. 10) Water Balloon Pinatas - Hang balloons from your monkey bars or clothes line. Let the kids take turns hitting the "pinatas." 11) How Far Can You Go? See who can throw their water balloon the farthest. The kid who gets their's the farthest WITHOUT POPPING it, wins! 12) The Water Balloon Challenge is a water game for youth groups – one that’s designed to make a big splash! 13) Keep the music rolling and you can also play a fun game of Musical Water Balloons. Just like musical chairs, you will need 1 less water balloon each round (for instance, 5 players = 4 water balloons). Gently lay the balloons on the grass. Start playing some music and then have the kids walk in a circluar motion. At random intervals, turn off the music. When the music stops, the kids need to find a ballon and sit on it. Whoever is left without a water balloon to sit on is out. The last child left in the game is the winner. 14) Splash and Score Baseball - Kids can test their aim and douse their opponent at the same time with this water balloon game of throwing and blocking skills. 15) Water Balloon Spoon Races -Use a plastic serving spoon or a wooden spoon for this simple summer game. 16) Fill the Bucket - This is a great team game perfect for a kid's group or camp. Each team uses water balloons to fill up a bucket. Whichever team fills the bucket first wins! 17) Water Balloon YoYo - Cut a rubberband in half. Then, attach the rubber band to the water balloon. The kids have to yo-yo them up and down until the last one with their balloon in tact wins! 18) Water Balloon Tag - Whoever is “it” carries the water balloon. If you get hit and the balloon breaks then, “Tag you’re it! 19) Even preschoolers can have fun filling up the water balloons. So, this game idea is simple. Just let the kids try to fill up the water balloons with the hose. Whoever can make the biggest balloon without it popping it is the winner! 21) Pop the Sharks - Draw a simple shark face on about 10 water balloons. Then, fill a kiddie pool with water and add the balloons. Give each child 15 seconds in the pool, and whoever pops the most sharks wins. 22) If you have 8 or more kids, find two sheets or table cloths for a Group Catapult. Have each child hold a corner (4 kids per sheet). Then, throw a water balloon onto the first sheet and have the 1st team try to propel it over to the 2nd teams table cloth. This video shows how it's done. 23) And, finally....everyone loves a good old fashioned Water Balloon Toss. Everyone line up and stand across from your partner. Everyone takes turns tossing the balloon to their partner. The last team to pop their balloon wins! Learn more about the Imperial Toy Kaos Portable Pumping Station, here. Did you know that 80 percent of women in leadership and executive roles in the U.S. were Girl Scouts and Girl Scout alumnae comprise 70 percent of women in the U.S. Congress? Clearly, there is so much more to Girl Scouts than than just the cookies! 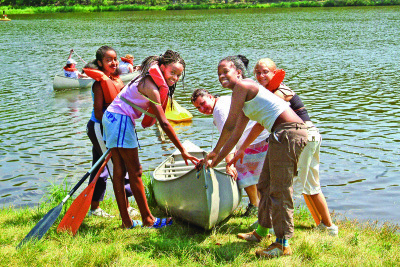 The Girl Scouts of Eastern Pennsylvania operates six local campgrounds with numerous camping opportunities for girls between the ages of 5 to 17. Athletics, Hiking, Archery, Horseback riding, Swimming, Arts and crafts, Cookouts, Campfires, Nature activities, Singing, Games, Boating, Science, singing, Teambuilding activities, and Wishing candles. Not ready for sleepover camp yet? They have day camps too! Swimming, Arts and crafts, Archery, Sports, Art, Cooking, Sports, Outdoor exploration and More! The 2014 Camp Guide is now available! Click here to download a PDF copy of the guide.